The Pure Water Fed Window Cleaning delivers better cleaning results due to the dirt particles being agitated using a purpose made, soft bristled brush, and rinsed away using completely pure water. You may be surprised to know that no chemicals or detergents are used. You will likely notice that the windows seem to stay clean for longer. Legislation now limits the use of ladders. 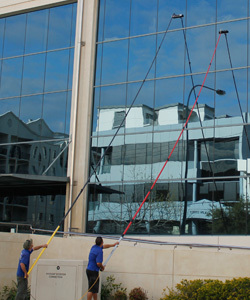 The Water Fed window cleaning method allows us to carry out the works from the safety of the ground. Many customers appreciate that they do not need to worry about the window cleaners suddenly appearing in the window. We are now able to reach with ease previously inaccessible aspects of your property such as fourth floor windows.